Today is the final day of MommyMaestra's Back-to-School Fiesta. Before we finish this week, though, I have two more excellent giveaways for you. The first comes from Disney Junior and the new series, Doc McStuffins. You may already be intimately familiar with this show if you subscribe to Disney Junior, but if you aren't let me sum it up in two words: educational and sweet. Best suited for kids in preschool through 1st grade, Doc Mcstuffins is the story of a six-year-old girl who plays doctor to all of her toys' ailments. I love this series because it reminds me so much of my own daughter, who at 6 years old spent countless hours ministering to the mysterious afflictions of her (many) stuffed animals. You may remember this post where I shared pictures of her and her lucky patient, and talked about the wonderful benefits of role playing in children. I strongly believe that children learn through play, and imitating real-life situations helps them to understand the process and dispel any fears associated with it. Going to the doctor especially, can be a difficult event for kids, which is another reason why I like this show. And my youngest (who is now six) really enjoys make believe and role playing with his toys, too. We received a Doc McStuffins gift set for this review, and it came with the doctor equipment (a lab coat, stethoscope, clip board, etc.) that made my son squeal with delight and sent my daughter running to her room for her own similar set of medical equipment. They then proceeded to ask me questions I prefer to only answer once a year. How's your vision? Have you been gaining weight? Do you eat right? Do you get plenty of sleep? Oy. 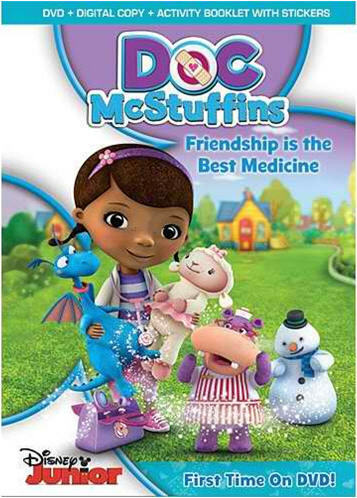 This week for the first time, Doc McStuffins is available on DVD. It includes five full length episodes, each consisting of two 11-minute stories, a Digital Copy of the episodes and also comes packaged with Doc’s special Big Book of Boo-Boos with fun activities plus character and boo-boo bandage stickers. Disclosure: I received a Doc McStuffins gift set to review for this giveaway.